← Are Linda Harvey’s Most Recent Anti-gay Comments Perverted or Just Wrong? 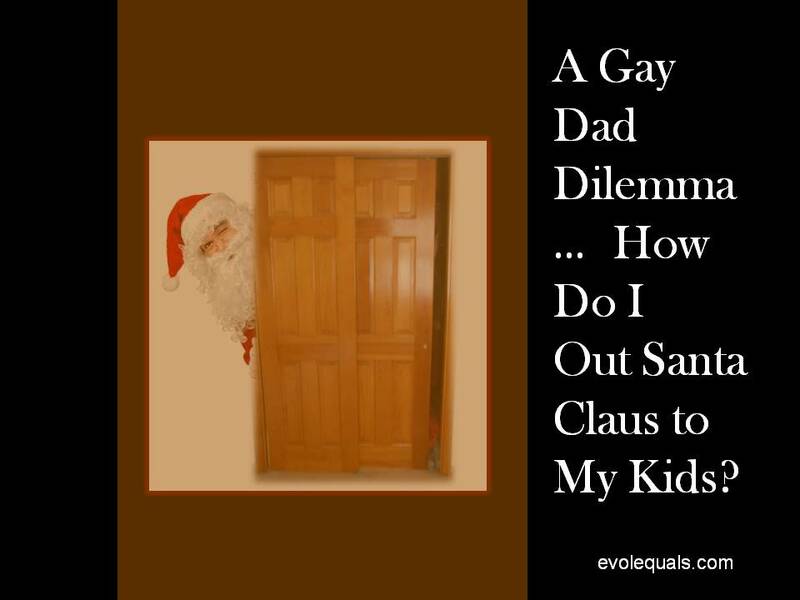 A Gay Dad Dilemma…How Do I Out Santa Claus to My Kids? How did I get into this predicament? How did I not see this coming? I mean… really. My sons are both 10. Our family tradition follows that of many others, a jolly old man with reindeer arrives mysteriously to our house late Christmas Eve and leaves wonderful gifts for them under our tree. It is magical. It is wonderful. It is life as they would want it to be. Except… it isn’t real. I have been more than a participant in this happy charade. I have been the mastermind. Granted, I had the help of the whole world around us, all of society and the collusion of modern media. So, why is it, now that we are getting to the age of “the truth comes out” that I am feeling like I am in strangely familiar territory… and territory that I never wanted to be in again? Why? Because again, as I just said…this is another coming out. I am flashing back almost three decades. I was lock step in another family tradition, the one that said the eldest son would go find a girl and date her, and marry her. The feelings to do so would enter mysteriously into my consciousness, and leave little grand babies under my parent’s tree… err, in the nursery. It would be magical, wonderful and life as my parents would want it to be. But of course, it was not real either. I worked very hard back then on my subterfuge. Everything, of course, was at stake. If they found out, they would not love me anymore and all that would be left was a life of shame and loneliness. It is no wonder that this current subterfuge came so naturally then. I was deeply comfortable with creating an alternate reality and making a great case for it for the casual observer. Back then, I cruised attractive women in the presence of my parents and feigned embarrassment when they noticed me doing it. Awww, how embarrassing… you saw me look at the pretty lady that I have absolutely no interest in.. In the current version I upped my game by leaving foot prints, having the exact last minute requested gift they muttered hours before under the tree the next morning and photoshopped evidence of a surprised Santa in front of our very tree. My evidence has been so good that my sons have actually recently started to realize The Truth, only to remind them selves of The Proof, and faith has taken over again. So here I am, looking out from the closet , part two. This time, the hangers are doing a jingle bells clanging thing. My first step needs to be answering the ultimate coming out question. Do I bring it up first? Or do I drop hints and let them bring it up when they start to figure it out? I employed the latter with my parents. That did not go very well. Have you gone gay? That was the question my sloppy behavior lead them to ask. Has Santa gone non existent? No, I can’t face that coming from my sons. Mom and Dad, I have something to tell you./ Jess, Jase, I have something to tell you. What’s that son? / What’s that Daddy? It is about my sexuality. / It is about Santa. Oh? What is it? / Oh? What is it? You’re…not……gg..ggg / Whhh…what do you mean? It’s not real. / Santa is gay. Huh? / Oh…. Cool! We thought so! Yeah. Yeah. That is a much better approach. Thank you all very much. This has helped a lot! This entry was posted in Family, Prejudice and tagged Coming Out of the Closet, Gay Dad and Santa, Outing Santa, Rob Watson, Santa Coming Out of the Closet. Bookmark the permalink. 11 Responses to A Gay Dad Dilemma…How Do I Out Santa Claus to My Kids? OK, seriously, let them bring it up, and then let them know that they are now old enough to have the truth. Santa is indeed real (he lives in your heart). By being Santa for someone, you can spread love and kindness to those who may not have it, do not expect rewards for being Santa, do not expect a “thank you” for being Santa, just enjoy the fact that you did something nice for someone else and made them feel good. It’s highly likely – they already know. Well if Dad dresses up, Santa in this case IS Gay. But to get down to business, I think you’ll find they have a good idea that he doesn’t exist and are only keeping it up to humour you. This year, just put the presents under the tree with out all the showmanship. They may say something, then will be the time to tell them, but as i say, I think you’ll find they already know. You can tell them that Saint Nicholas is the person Santa Claus was names after (say Saint Nicholas quickly 10 times). Saint Nick gave gifts to the poor and that is why he is the giver of gifts to children at this time of the year, although he gave the gifts when they were needed, not particularly at Christmas. As I say though, I think you’ll find, that at 10 years of age, they know really. https://www.youtube.com/watch?feature=player_embedded&v=NYdpte1W0vk David Sedaris on St. Nicholas. Awww I know my daughter is 11 and Santa was outted by accident by her teacher this year. I was sad. I don’t really remember having the Is Santa Real conversation. Just talking about how Santa is the spirit of giving, which lives on regardless of whether one believes in Santa or not. I read all the Santa books and watched all the Santa shows with my kids (all four) and I’m doing that with my grandson, now. The kids wrote letters to Santa. I’m going to have to ask them what they remember about finding out he wasn’t ‘real.’ My parents gave us gifts that said “From Santa” for awhile, but I sure don’t remember when I realized they were Santa. Loved the surprise ending on your parallel dialogue! Well, I don’t what to suggest about your dilemma, but the article made me smile non-stop. Especially the last parallel dialog. Thanks!